“Before any of us can fully live as God created us to live, we must first die to our desire to control our own lives or live life according to our plan and will” (The Blessings of Brokenness, 28). Sometime this past summer, before the air grew crisp and the scents and sights of autumn were in the air, I took my kids outside to let them play in the backyard. As I sat observing them while they ran around and played, I watched my daughter beat a small tree with a stick. Pretty soon my son joined in with a stick he had found, following his sister’s lead. “What are you doing?” I asked after a few minutes. “I want it to be fall,” my daughter said as she continued to beat determinedly at the slender trunk, trying to shake the green leaves off. “Oh sweetie, you can’t make the leaves come off before they are ready,” I said. As I spoke, I thought of the spiritual lesson that could be taken from my children’s insistence on creating a season that hadn’t yet come. Don’t many of us do the same thing? Some time ago, I sat in a church service with an uneasy heart. There was a music opportunity that I wanted to be a part of, but I felt unsettled in my spirit. That very afternoon, I was scheduled to meet with a new worship pastor, and yet I felt a tugging deep inside. A pause. During the course of the sermon, it began to dawn on me that perhaps I wasn’t to walk into this opportunity. Perhaps I was to say no. The pastor didn’t mention music in his message or say anything about my specific situation. Instead, he gave a story about his brother having a choice from the school about taking a 7th grade math course over and not wanting to do it, but his parents insisted on it because his math skills were weak. And I knew right then that there was “a 7th grade math” that God wanted me to take. To do so was going to take discipline and was going to be a lot less fun than singing on a stage and writing songs. There was a training that I was to go to instead and project I was to finish. I was going to try to do all of that and music at the same time, but I began to get the sense that I wasn’t to go that route. I agonized over that decision all afternoon. I even went to the meeting hoping that maybe I heard wrong during the sermon. But like a bell tolling in my spirit, the ring getting louder and louder throughout the day, I knew that God was telling me “no” in regards to music. And it was the hardest no I have ever had to accept. I didn’t like the idea that God could control my talents. Yes, I wanted to surrender and do all of the things that you hear about in worship songs. But when it came down to it, I only wanted to surrender if it was easy and God didn’t ask for hard things from me. I wanted to be in a different season than the one I was in. It wasn’t until later that I remembered a phrase I had heard once in a sermon: sometimes you have to kill something first to make it live. In Genesis 22, as Charles Stanley notes in The Blessings of Brokenness, Abraham is instructed to sacrifice his only son. Obviously, I am not instructing you to murder anyone and neither is God — and that’s not a discussion we’ll be getting into in this post — but Abraham was asked to step out in faith. Abraham believed the whole time that he was being asked to sacrifice his son that God would provide a lamb. And sure enough, when he presented all he had to God in the ultimate test of faith, God came through for him. Clearly, God has our good in mind even if what He instructs us to do initially looks like a death of some kind. A death of a dream. A death of our reputation. A death of an opportunity. We can trust that where He leads us, even if it means giving up something precious, will end in good. He will provide when we give up all we have. But we have to trust even when that means giving up something very promising or attractive that we don’t want to let go of. I went to a training that answered the spiritual questions I was battling with at the time. Many of the principles I learned in that training are those I write about here on this blog and share with you on a regular basis. I worked on a project I had started that involved going back to my former school community. During the process of going through that project, God revealed to me the wounds I was struggling with (mainly, an addiction to approval). Identifying those wounds helped me find inner healing and helped me be able to find forgiveness and restoration where there had been guilt and shame in my past. God worked on my pride and my competitive spirit by placing me in a different position in the church. He worked out some of my unfavorable traits week after week by putting me in a position of service to others rather than a position of prominence. God gave me the directive to start a blog to share my journey and story of healing with other women. The time and energy I had to invest to learn the world of blogging was more than I would have been able to invest in if I had been in music. As a result of the school project that I really didn’t want to do, God opened a door I did not expect by orchestrating a job change for my husband and a move for our family to a new community. Although I didn’t know it at the time, we were not meant to stay at the church we were at but instead were intended to move to an entirely different area. Friend, as Nicki Korzaiz emphasizes in 5 Habits of a Woman Who Doesn’t Quit, we need to “accept the season” that God has put us in. Perhaps we are in a season of refinement or hardship, and we don’t like it. But He knows what we are going through, and if we believe that He truly has our best interests in mind and will make more out of us than we can in our own strength, we can submit to the hardship knowing that there is a blessing on the other side. As Abraham reasoned when he bound his son to the altar in obedience, God can provide a lamb where there is none or bring the dead back to life (Genesis 22:7,8; Hebrews 11:17-19). Therefore, there is no sacrifice too great — not even that which we perceive as the death of a dream or our most precious talent or possession — because God can give to us or resurrect whatever it is He asks us to lay down. Questions to Consider: Is there something God is asking you to put aside or sacrifice at the moment? Are you questioning His wisdom because it doesn’t make any sense? Leave a comment below. 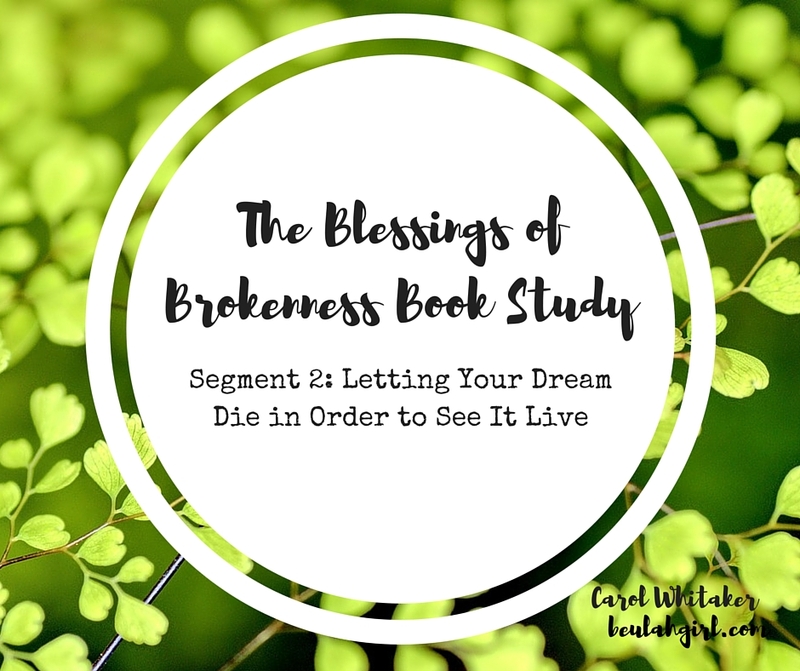 Book Study: This post is part of a five week book study over Charles Stanley’s The Blessings of Brokenness: Why God Allows Us to Go Through Hard Times. We will have a live video chat over chapters 3 & 4 this Monday, June 20, @ 9 p.m. EST. Click the video chat link to subscribe or watch the replay. To join us for next week, read chapters 5 & 6 by next Friday, June 24.